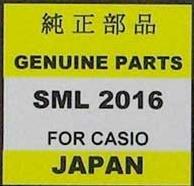 Casio SML2016 SML-2016 Accumulator Battery. Type: Sanyo Lithium Aluminium Alloy - Manganese Dioxide. Voltage: 3V. Capacity: 18 mAh. Height: 1.6 mm. Diameter: 20 mm. Price: £15.99 each. (£15.50 if you buy two or more). Postage and packing included. Functional replacement for: Sony / Panasonic / Sanyo Lithium Aluminium Alloy Manganese Dioxide (MnO2-LiAl) SML2016 Batteries. This small rechargeable SML2016 battery is commonly used in Casio watches. For example some Casio ATOMIC SOLAR POWERED G-SHOCK take these SML-2016 cells. The SML2016 comes from the "SML" series of Lithium Manganese Dioxide batteries manufactured by Sony and/or Panasonic. Our Panasonic SML2016 replacement watch battery is a genuine Casio spare part. In most cases, replacement of the SML2016 battery is an easy task.